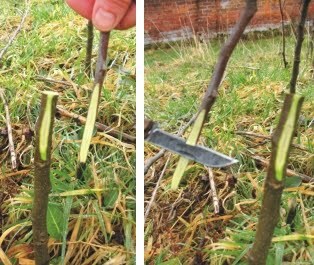 I managed to persuade the head gardener here at Walcot to show me how to graft fruit trees. 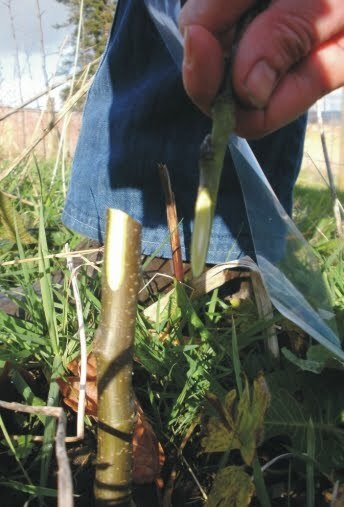 After a crash course this week I was let loose on a row of MM 106 apple rootstocks to practice field grafting using whip and tongue technique. For those of you experts out there, please don't flinch at my beginner's technique. I am acutely aware there is a long way to go with this, but I must admit I'm already hooked and spend most of the afternoon out in a bitter wind on a raw February day working away to improve and only the hens with me to pass judgement. 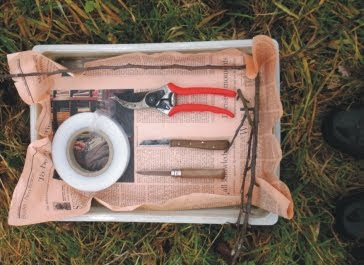 I gathered scions from a Russet and Winter Gem in my garden as material to graft on. This is what I began with in the top pictures, then taking a razor sharp "Tina" knife I cut the 2 sections, one on each piece to marry up the Cambium layer as best I could - here you see I've got to do a bit more practice! I made the "tongue" incision to correspond on the opposing sides, then wedged the 2 parts together, leaving the characteristic "church window" arch exposed above the rootstock. 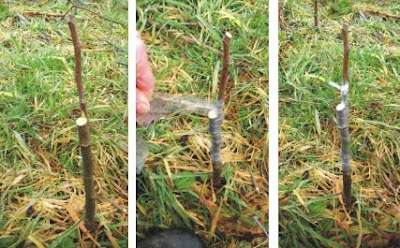 The last stage was binding up the grafted sections, and onto the next one till I had just about completed a row and they stood like like plastic bristles in the meadow. Now it's just patience to wait and see which have "taken".